When I attended the Lush Meadowhall VIP re-opening party I received a goody bag that contained some Toothy tabs (you'll find a post on them here) and some bath products (posts here and here) and was told that I could also have a skin consultation and then choose a face mask to take away with me. Unfortunately I didn't get a chance to have the consultation as it was very busy, but obviously I did pick up a face mask to try. I've tried a few of their face masks in the past (including Cupcake, Catastrophe Cosmetic and Oatifix) but I wanted to try one that I've not tried before. The one I really wanted to try was Rosey cheeks, but I couldn't find one on the display, so instead I decided to try their festive new addition Cranberry*. This contains cranberries to work as an antioxidant, fennel seed infusion (and also fresh fennel) to cleanse, rose clay for the gunk you want out and argan, patchouli, lemongrass and sandalwood oils to leave your skin nice and moisturised. There is some talc in there though so if you don't like talc in your face products this would be one to avoid. The last face mask I tried from Lush was Oatifix and I really did have a problem trying to get that one to stick to my skin (and then once it was in place I couldn't get it off!) but there's no such problem with this one. It's nice and soft and smooths over the skin easily. As is the case with most Lush face masks (unless you're using the new self-preserving Mask of Magnamity one) it should have been kept in the fridge and therefore it's super cooling to apply. The main thing I've noticed about applying this one is that it has a very strong scent to it and checking the ingredients it does contain perfume. If your skin doesn't like perfumed products or your nose is particularly sensitive to strong smelling products applied to your face then I would give this a miss. I'm ok with the smell but it is just boarding on being a little too overpowering for me. After leaving on for 10 minutes or so this is very easy to remove. You can use a splash of water and a quick rub round with your hands before another splash or two to rinse or of course you can use a flannel or muslin cloth to gently wipe it away. Once rinsed away I'm left with bright, calmed, moisturised and happy looking skin. As I have dry and often dehydrated skin I do have a problem with some masks drying out my skin and leaving it feeling a little tight and rough, but this wasn't a problem at all with this one. I've forgotten to double check the expiry on this but if I remember correctly the fresh face masks usually have something like 3 weeks on them? I've always found that they can last much longer than that and I'm up to around 7 weeks with this one and it's still perfectly fine. I just keep going with them until they start to dry out or the smell or appearance of the product starts to change. Then it's time to get rid and pick up a new one. Don't forget to keep hold of those black pots though as once you have five you can take them back to store and exchange them for a free mask. I'm really enjoying using this mask and if you'd be ok with the strong smell I'd recommend giving it a try. Be quick though as although I don't think it says limited edition on the pot (I don't have it with me to check!) it is part of the festive collection so I don't think it'll be around for long. 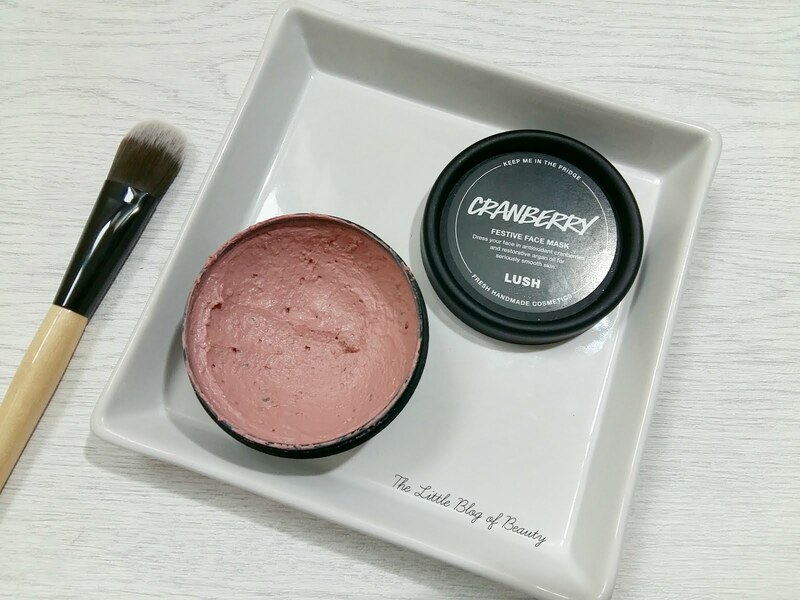 The Lush Cranberry festive face mask is £6.75 and is available on the Lush website and in Lush stores. Which is your favourite Lush face mask? I've never actually tried a Lush Face Mask, I need to get down there and try one soon, this sounds really nice, not sure about the perfume though. I've only ever tried the cupcake face mask which worked wonders for my skin! I would like to branch out a bit and try some others! I really like the sound of this, I always mean to pick myself up a fresh face mask but I never seem to get around to it! I've only ever tried the Catastrophe face mask from Lush which I did like... this cranberry one sounds delicious!